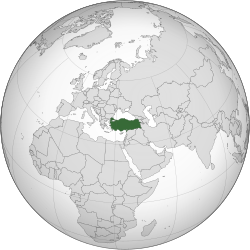 Turkey (Turkish: Türkiye) is a country in both Europe and Asia. The area of Turkey is about 780,000 square kilometres. Turkey is a republic. There are 81 provinces in Turkey. The money of Turkey is called Turkish Lira. The capital city is Ankara, a city in central Anatolia. The cultural and economic center is Istanbul, which is in Europe. In the past Istanbul was called Constantinople. The republic was founded in 1923, after World War I and a war of independence (Kurtuluş Savaşı). Before that, Turkey was the core of the Ottoman Empire. Many civilizations were located in the area that is now Turkey, like the Hittites, the Roman Empire and the Byzantine Empire. Many important events in the history of Christianity happened in Turkey. Because it lies in both Europe and Asia, some people see Turkey as the "door" between Europe and Asia. Modern Turkey has a strong economy. Its warm climate lets many kinds of food crops grow, and livestock and forestry are important industries. Turkey is one of the countries in the world that makes enough food to feed itself. There is a strong manufacturing sector making airplanes, electronics, cars, clothing and textiles for home and for other countries. These days, Turkey is a popular place for tourists to visit. It has hundreds of kilometers of beautiful beaches on its Aegean and Mediterranean coasts, and many important historical places. The first major Empire in the area was the Hittites (during the 18th century to the 13th century BC). The Hittites, who spoke one of the Indo-European languages, developed a high culture from Central Anatolia. Their Kingdom was destroyed by the Cimmerians in the 7th century BC and the successor States were Lydia, Caria and Lycia. From 1950 BCE, Greeks and Assyrians inhabited parts of southeastern Turkey. The Assyrian capital was named Tushhan (900-600 BC). The Assyrians ruled over southeastern Turkey until the Assyrian Empire was conquered by Babylonia in the year 612 BC. Then Anatolia became home for various kingdoms including the Persian Achaemenid, Hellenistic kingdoms, Roman Empire, Byzantine Empire (Eastern Roman Empire) and Mongol Empire. In World War I the Ottoman Empire was one of the Central Powers. During the war, 1,500,000 Armenians in the Ottoman Empire were massacred in the Armenian Genocide. Turkey denies that the event was genocide. The Central Powers lost the war and the Ottoman Empire was destroyed, but after that Ataturk led the army to get rid of foreign enemies, like the Greeks. Mustafa Kemal Atatürk was the first President of Turkey. He made many changes that made Turkey more modern. But some people did not like some of the things he did because they thought they were against Islam. Religious secondary schools were gotten rid of, for example. For many years Kurdish guerrillas (usually called the "PKK") fought the Turkish government. They said they were fighting so that the Kurds in the south east of Turkey could have autonomy and decide more things for themselves. But the government and most other countries in the world said they were terrorists. In 2013 the PKK stopped fighting. About 80 million people live in Turkey. Most of them are ethnic Turks. About 15% are ethnic Kurds. Many refugees from Syria live in Turkey because they have run away from the Syrian civil war. Most Turks are Muslim. The biggest city in Turkey is Istanbul which has the biggest population of any city in Europe. Turkish people have many ethnic and famous foods, such as mantı, kebap, iskender kebap, Turkish dessert, baklava, çiğ börek, içli köfte, and other foods. Turkey is in the OECD and the G-20, and is one of the 20 richest countries. The Turkish currency is called the Lira. The first coins were made in Turkey. The capital city of Turkey is Ankara. The largest and the most crowded city is Istanbul which is the only city in the world that has land on two different continents. The third largest city is the coastal city of Izmir which is the main port of the country. Turkey is divided into 81 provinces. Each province has its own little government but they can only make decisions about small things: the government in Ankara decides important issues. The provinces are in 7 regions. Each province is divided into districts. There are 923 districts altogether. Most people in Turkey speak Turkish. It belongs to the Turkic language group, which also includes many other languages spoken across Asia, such as Azerbaijani and Tatar. The Turkish language came from central Asia, but now it is a bit different from the languages spoken in central Asia. Many of the young adults can also speak English, which is taught throughout Middle and High school. Turkey has a modern culture. The life style of the Turks is similar to that of the Europeans. Turkish Culture is a cross between Western countries and modern Islamic culture. Different parts of Turkey have similar but not exactly the same lifestyles. The Lifestyle in the West, South West and North West is more modern. People living in that area have modern accents. Southern Turkey also has a modern life style but Turks living by the Mediterranean have southern, much thicker, and more masculine accents than western Turkey. Northerners, by the Black Sea have softer accents and also have modern lifestyles. Eastern and South Eastern Turkey is made up of mostly Kurds. They generally have less modern and more Islamic lifestyles. Rich Cities in Turkey include Istanbul, İzmir, Ankara, Mersin ( also known as Icel), and Antalya. The majority of Turkey is made up of Turks. The main minority is the Kurds. Kurds live mostly in South Eastern and Eastern Turkey and have poor financial situations. ↑ "Population". Turkstat. December 31, 2013. http://www.turkstat.gov.tr/HbGetirHTML.do?id=15974. Retrieved 29 January 2014. ↑ "The World Bank: World Development Indicators database, last revised on 18 September 2012." (PDF). http://databank.worldbank.org/databank/download/GDP_PPP.pdf. Retrieved 2012-11-04. ↑ "World Data Bank October 2012". World Bank. 2012. http://databank.worldbank.org/ddp/home.do?Step=12&id=4&CNO=2. Retrieved 13 October 2012. ↑ 6.0 6.1 "IMF World Economic Outlook Database, October 2012". International Monetary Fund. 2012. http://www.imf.org/external/pubs/ft/weo/2012/02/weodata/weorept.aspx?sy=2011&ey=2017&scsm=1&ssd=1&sort=country&ds=.&br=1&c=186&s=NGDPD%2CNGDPDPC%2CPPPGDP%2CPPPPC&grp=0&a=&pr.x=27&pr.y=5. Retrieved 13 October 2012. ↑ "Human Development Report 2011" (PDF). http://hdr.undp.org/en/media/HDR_2011_EN_Table1.pdf. Retrieved 2011-11-02. This page was last changed on 10 November 2014, at 06:22.